Today's patients are very proactive about their appearance and their health. They are more concerned about treating the early signs of aging than their parents. Patients today are looking for faster, less invasive procedures with little, if any, downtime that can reduce forehead lines and "crow's feet", frown lines, smoker's lines around the lips, and sagging cheeks. Many of them want to treat aging in their neck, chest, underarms, abdomen, hands, thighs and knees, and in some cases even their breasts. Titan Tissue Tightening is performed by Dr. Lowell Hughes for patients in our region looking for a non-surgical, nonablative, procedure to tighten their loose skin. What is Titan Tissue Tightening? 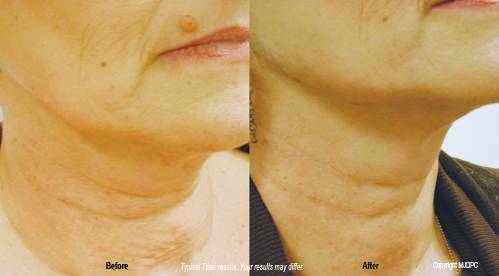 The Titan is the first light-based solution for deep skin tightening. The procedure is non-surgical and uses safe, infrared light instead of radio frequency to cause the collagen in the skin's dermis to contract and tighten. It can be used in all areas of the body where tighter skin is desired. While the infrared energy is heating the dermis, the Titan's continuous-contact, cooling handpiece is keeping the skin's outer layer cool and comfortable. 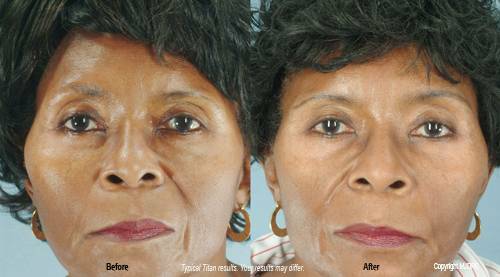 Who can be treated with Titan Tissue Tightening? Since the Titan uses infrared light to heat the tissues below the skin's surface, all patients concerned with loose or sagging skin, regardless of skin type or color, may benefit from Titan Tissue Tightening. Tissue tightening with the Titan is done in our office. The procedure takes from 15 - 60 minutes depending upon the size of the area. Most patients do not require any anesthetic. However, some patients prefer to take a mild oral or topical pain reliever beforehand. During your procedure our physician guides the Titan's computer-controlled delivery device over your treatment area. You will feel a warming sensation as the Titan's infrared energy is delivered to the deeper layers of the skin. The energy causes the collagen support tissues to contract and tighten. The underside of the handpiece provides cooling to your skin's surface, protecting it and keeping you more comfortable during the treatment. During your consultation, you will want to explain the level of skin improvement you hope to achieve to our doctor. Dr. Lowell Hughes will examine your skin and your medical history to determine if you are a good candidate for Titan Tissue Tightening. Together you will discuss your expectations and decide on the best treatment for you. Photographs may be taken for reference to compare your results. What are the benefits of Titan Tissue Tightening? What results can I expect from Titan Tissue Tightening? Loose and sagging skin can be tightened. Fine lines and wrinkles can fill in while deeper frown lines can be softened. Some patients see results quickly and are satisfied after only one treatment. However, for most patients the results are gradual as more collagen is produced and the skin tightens over a 3 - 6 month period. How many Titan Tissue Tightening treatments will I need? Depending on your skin's laxity, the area to be treated and the results you desire, multiple treatments may be required. During your consultation, Dr. Lowell Hughes will advise you as to the number and frequency of treatments that may be required to achieve your desired results. Keep in mind that the results from Titan Tissue Tightening are gradual and may take from 3 - 6 months to maximize the effects of the treatment. What about recovery from Titan Tissue Tightening? After Dr. Lowell Hughes performs Titan Tissue Tightening, you may notice some mild swelling and/or redness in the treatment area. This usually disappears in a few hours. You may resume normal activities immediately.